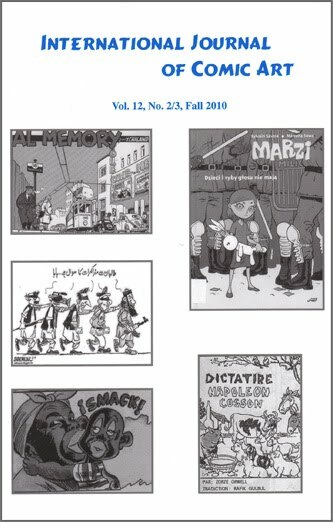 The latest International Journal of Comic Art (Volume 12, No. 2/3) has been published. I have a couple of articles in there. They’re reviews of two events from The University of Dundee. One is on Gerald Scarfe’s illustrated talk, and the other is on the third Dundee Comics Day. The latter featured David Bishop, Crawford Coutts, Warren Ellis, Gary Erskine, Mel Gibson, Alan Grant, Ian Hague, Peter Hughes Jachimiak, Ian Kennedy, Bill McLoughlin, Keith Robson, Julia Round, Roger Sabin and Emma Vieceli. More information can be found here. I am writing this with a comic on my desk - more precisely, a calendar featuring a single-frame cartoon taken from what is undoubtedly my favourite comic strip ever, The Broons. The Broons is a comic that is published every week in the Scottish newspaper "The Sunday Post". It first appeared on 8 March 1936 and, while I haven't been reading it for as long as that, I have been reading it for as long as I can remember. 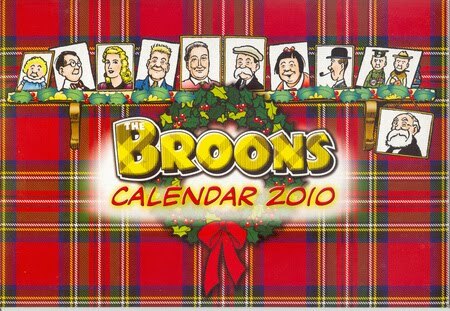 The Broons, along with its sister comic Oor Wullie, plays a big part in many Scottish childhoods, and their Annuals are an eagerly awaited Christmas gift in many households, including my own. For me, the success of these comics - both The Broons and Oor Wullie are veritable Scottish institutions - is all down to nostalgia: nostalgia for a working-class past in which large families all lived on top of each other in tenement flats that were, I'm sure, considerably less charming to live in at the time. Even when modern life creeps into the stories from time to time, we are often still left with the impression that "the good old days" were best. In my case, the comics remind me a little of my own upbringing, a little more about the stories my parents used to tell about their childhoods, and a lot about the joy I used to feel on reading them as a boy. I am also a huge fan of the language used in the comics, since they are written in Scots (although depending on the period, it is often a highly anglicised version of Scots) and it is rare if not unique for the language to have such widespread, national exposure over such a long period of time. And what a long period of time it is! Next year will see the 75th anniversary of the first Broons comics. How much of the work of today's comic book artists will, like these characters created by Dudley Watkins, still be being read every week three quarters of a century after their birth? Not many, I suspect. For more on my good friend Stuart check out his website here and his blog here. One could be forgiven for thinking Davis had thrown a wobbler and put a political viewpoint into his cartoon. A contentious one, at that. But no, as far as I understand, Davis writes them a long time in advance. It would seem the distributors and newspaper teams have learned to trust Garfield so much that they don’t bother reading it.